NDSU › Publications › Food and Nutrition / From the Garden to the Table: Salsa! While many excellent types of salsa are available in supermarkets, you can tailor homemade fresh salsa to suit your own taste buds. By following guidelines in this publication, you can safely process salsa in a water bath canner for later enjoyment. Over the past decade, Americans have grown to love salsa on everything from scrambled eggs to the more traditional dishes of Mexican and Puerto Rican heritage. While many excellent types of salsa are available in supermarkets, you can tailor homemade fresh salsa to suit your own taste buds. By following research-tested recipes, you can safely process salsa in a water bath canner for later enjoyment. While you can make salsa by buying fresh produce, why not go one better and grow your own ingredients for an even tastier sauce? While many variations will exist to suit individual tastes, a basic salsa recipe will contain tomatoes, onions, garlic, jalapeno peppers, and often, cilantro and spices. Juice from lemons or limes, the only ingredients that can’t be grown in a northern garden, may be added to put a little “edge” to the flavor. The attractive red color of salsa comes from the vine-ripe tomatoes that are used to prepare it. The resulting sauce attracts us to dip chips into it or spread it over food. Standard tomato varieties will produce a juicy sauce, while paste tomatoes will produce a thicker sauce. If you have never grown paste tomatoes before, you will find them meatier, less juicy, and rich in acid and sugar content that contribute to great flavor. All tomatoes grow best in a rich, loamy soil, with water and nutrients being supplied on a dependable schedule for maximum productivity. Drip or micro-irrigation is best, but if that cannot be provided, hand water carefully around the base of the plants, keeping the water off the foliage. Fertilization should take place at the time of planting with a “starter” type (such as a 10-52-10 or something similar) that is higher in phosphorus than nitrogen, and again once a week for the next three weeks. The remainder of the growing season can have a more balanced nutrient source (such as 10-10-10) added weekly. While there are many reasons that tomatoes may not bear, the three most common are too low a temperature, too much nitrogen, or not enough sun. Don’t plant until the soil temperature is above 60 degrees Fahrenheit. Plant them in a location with as much direct sunlight as possible, and don’t use any left-over turfgrass fertilizer on them — it’s too high in nitrogen. ‘Roma’ is the most common variety of paste tomato on the market. In fact, it is so popular that the name has become synonymous with the paste-type tomato. It is the basic standby tomato that other paste-type tomatoes use for comparison. It takes about 75 days to mature and produces an abundance of 2-ounce fruits. ‘La Roma’ is a hybrid improvement that matures in about 62 days, with heavier fruit, ranging in size from 3-4 ounces. Like the ‘Roma,’ the taste is excellent. ‘Mamma Mia’ is the top yielder of the paste varieties, with fruits in the 3-4 ounce size, but producing in overwhelming numbers. Because of this, ‘Mamma Mia’ should be caged for support and special attention paid to the watering and fertilizing. It takes about 62 days to mature. ‘San Marzano,’ a rectangular shaped fruit with a deep red color, is an excellent tomato for a thick, meaty sauce. It takes about 80 days to mature. ‘Rio Grande’ produces large, blocky-shaped fruit in great abundance, making an excellent sauce. This variety is good for areas where wide swings in temperature exist during the growing season. It takes about 80 days to mature. Burpee’s ‘Big Boy,’ which produces big beefsteak tomatoes, is the comparison standard. While this “beefy” tomato and its relatives are a sight to behold, and a source of “bragging rights” for the dedicated gardener, they require a lot of work to grow, and their overall yield is less than that of the standard large or slicing tomato. In the slicing category, All-America Selection winners are ‘Floramerica,’ a 1978 winner, and ‘Celebrity,’ a 1984 winner. These awards are not passed out easily. Winners must show disease resistance and high quality productivity across a wide spectrum of growing conditions in North America to be given this recognition. Both are mid-season producers (72-75 days) and make excellent “slicers” for sandwiches and salads. They also are outstanding for their canning quality. Their fruit size averages between 8-10 ounces. Both are determinate in growth, so no pruning is needed; simply grow them within a tomato cage. Those who want a truly early tomato that can be classed as a slicer can try ‘Early Girl.’ This variety produces 5-ounce meaty and flavorful fruit in as little as 52 days. This is a great variety for the upper Midwest because of the short growing season. One of the best varieties for container growing is ‘Heartland,’ with 6-8 ounce fruit. It matures in about 68 days, doesn’t need pruning and has large leaves that protect the fruit from sunscald. For those who live in apartments or condos, this variety would be the perfect choice to provide fresh tomatoes for meals. All of these are traditional red-fruited varieties and worthy of consideration. Often the question comes up about good yellow-fruited slicing tomatoes, their quality, acidity and productivity. One of the best on the market is ‘Lemon Boy.’ It bears clear lemon-yellow fruit, inside and out, and has a sweet, mild flavor. The fruit matures in about 72 days and averages 7 ounces. This is an indeterminate variety so it would need staking and some pruning. It is commonly believed that yellow tomatoes are low-acid, but tests have shown that their acidity levels are about the same as red tomatoes — pH 4.6 — which is the dividing line between high- and low-acid foods. Peppers have the same basic growing requirements as tomatoes: plenty of sunshine, water and balanced nutrition. Growing peppers differs from growing tomatoes, because peppers need more time to start as transplants and warmer soil temperatures for planting. While tomatoes can be started from seed 28 days before transplanting, pepper seed will require 8 to 10 weeks before optimum planting time. Most will mature in 65 to 75 days from transplanting, although the hotter varieties like the ‘Habanero’ will require 90 to 100 days. Sweet peppers produce large blocky fruits that are usually harvested green. If the season is long enough and the gardener has sufficient patience and allows the fruits to remain on the plant longer, the fruit will turn fiery red, which increases their sweet flavor and makes them a richer source of vitamins A and C.
Varieties to try include the many hybrids of jalapeno, especially ‘Mucho Nacho Hybrid,’ which has larger and hotter fruit than the standard jalapeno. It is a vigorous producer and matures in about 75 days. To get the largest bulbs, plant the individual garlic cloves in well-drained soil in the fall after the first good killing frost, or sometime around mid-October. Spring planting can be done, but the bulbs will be smaller. Insert the cloves into the soil 2-3 inches deep with the root end down. Most garlic is quite winter hardy, but it still should be mulched to prevent heaving. During the remainder of the fall, the roots will grow, but very little, if any, top growth will be noted. If you are looking for largest bulb production, select only the largest cloves to plant. Cloves found in the center of the bulb can be scatter-planted to produce garlic greens. The cloves should be spaced about a hand width (4-6 inches) apart. There are several types of garlic to consider. The typical variety seen in supermarkets is the softneck, Allium sativum. This variety stores the best and has the strongest flavor. Because of its soft necks, this variety can be easily braided. The bulbs are distinguished by medium-sized cloves surrounding smaller cloves in the inner two or three layers. The softnecks can be grown in northern gardens, but for assured survival over winter the stiffneck types (A. sativum var. ophioscorodon) are better. These plants are distinguished by producing a hard “scape” or flower stem that makes a 360 degree coil and forms a cluster of “bulbils” or miniature cloves. The stiffneck types produce bulbs that are composed of a single layer of large cloves and no inner ones. Their taste is milder and they are considerably easier to peel than the softneck types. When the “scapes” appear it is best to snip them off and use them in stir-fry. Allowing them to remain will result in the bulbs being considerably smaller. Harvest garlic when the foliage starts to “flag” or turn yellow. This is usually about mid-July to mid-August. Gently lift them with a garden fork and store them in bunches in an airy location. Some garlic varieties to consider include ‘New York White’ (softneck type), the typical market garden garlic seen in the eastern U.S. Prized for its ease in braiding, it has good flavor and is more winter hardy than the West Coast garlic. ‘German Extra Hardy’ (stiffneck type) is one of the most winter-hardy garlic varieties on the market, producing very large bulbs and cloves. It has good flavor and stores very well. Sow onion seed in the early spring as soon as the soil can be worked. Like garlic, onions should be planted only in well-drained, fertile sites. Standing water, after a heavy rain, will usually kill off either crop. Sow seed in rows barely in the soil (about ½ inch deep), with about two seeds per inch. As they germinate, thin to 3-4 inches to allow for larger bulb development. Because onions are shallow-rooted plants, water supply is critical to quality onion bulb development. At least 1 inch of water/rain is needed each week. Onion bulb development is daylength sensitive. Select varieties whose latitude range includes your planting site (Fargo, ND is 46 degrees N, for example). Onion sets are often popular with home gardeners, but typically a higher quality, lower disease incidence crop can be grown by direct seeding. In the north, some gardeners will sow the seed indoors in late February or early March to assure a harvest before the arrival of fall frost. When selecting onions for seeding, check the “days to maturity” notation and attempt to select those that are under 100 days. Anything beyond that should be started as transplants two to three weeks before moving outdoors. Harvest when the skins are evident and the tops are starting to fall over. Simply pull them and sun-cure seven to 10 days before cutting off the tops. Storage onions have the strongest flavor but sweeten during storage. Onion flavor like/dislike is very personal, so plant the variety and type that appeals to you. Yellow globe onions are commonly seen in supermarkets due to their long storage life and increasingly sweet flavor in storage. ‘New York Early’ is a 98-day, 38-50 degree latitude variety that has a firm but tender flesh that is considered a better eating quality than the hard, long-storage varieties. ‘Super Star F1 Hybrid’ is a 109-day, All-America Selection winner for 2001. A day neutral, it cuts nicely for salads and salsa but is not one for long storage. It’s advisable to start them indoors as transplants. ‘Mars F1 Hybrid’ is a reddish-purple skinned variety that matures in 104 days and is suited for the latitude range of 38-55 degrees. Start them indoors as transplants. Cilantro (Coriandrum sativum) is a plant species with a couple of popular common names — Chinese parsley and coriander — but they all refer to the same plant. When the foliage of the plant is used in making salsa, it is referred to as cilantro. When it is used to garnish food dishes and in salads, it is called Chinese parsley. When the seeds are used to flavor foods and beverages, it is called coriander. Cilantro is one of the easiest herbs to grow. Plant the seeds 12-18 inches apart in full sun, water in, and germination should be complete in 14 days. The difficulty in growing this plant is to keep it from bolting and producing seed, since it is the fern-like foliage that is commonly used to make salsa. Select cultivars that are known for foliage rather than seed production. The leaves add a distinct flavor to any dish, so small amounts should be added until the desired tasted is reached. Cultivars to consider are ‘Santo,’ ‘Leisure,’ and ‘Jantar,’ all of which are slow-bolting and have been bred specifically for foliage production rather than seed. Salsa has even surpassed catsup in popularity. Not only is salsa tasty, it’s also nutritious. A two-tablespoon serving generally contains about 10 calories and 0 grams of fat plus ample vitamin C and other nutrients. When preparing salsa, always start with high-quality ingredients. The quality of your end product is only as good as the quality of the starting ingredients. Fresh salsa can be made to suit your taste, so experiment with other ingredients. Some ingredients in fresh salsa, such as onions and garlic, store fairly well with little sacrifice in flavor. Other ingredients, like tomatoes, peppers and cilantro, are best used as fresh as possible. Any salsa recipe can be safely frozen, but slicing tomatoes will produce salsas with a more watery consistency. Follow research-tested recipes and procedures if you plan to can salsa. Tomatoes were regarded as poisonous for generations but became known as “love apples” and “apples of gold” in some parts of the world after they were discovered to be safe — and delicious. These fruits (because of their seeds) are nonetheless considered vegetables on menus. Tomatoes are low in calories and also provide vitamin C and potassium. There are many reasons to add tomatoes to your menu. Tomatoes, particularly in cooked products like spaghetti sauce, may reduce risk for certain diseases. Lycopene, a carotenoid pigment and powerful antioxidant, is responsible for the red color of tomatoes and protective effects. According to several research studies, lycopene may offer protection against certain types of cancer, particularly prostate cancer. Lycopene in cooked and processed tomatoes (canned salsa, canned tomatoes, tomato paste, spaghetti sauce) is more easily absorbed than lycopene from raw tomatoes. Lycopene absorption also is enhanced by eating some fat, like olive oil, in the same meal as tomatoes. The type of tomato used will affect the quality and texture of salsa. Paste/Italian tomato varieties such as ‘Roma’ will produce a thicker salsa, while slicing tomatoes will yield a more watery, thinner salsa, particularly if you freeze the salsa. Tomatillos (green tomatoes with a husk) may be substituted for other tomato varieties, but you must remove the dry outer husk before using. Choose fruits with a rosy color, plump shape, blemish-free skin and a texture that’s slightly soft to the touch. Tomatoes that are overripe, bruised or sunburned with yellow or green areas near the stem are lower in quality. For quality and safety, don’t use overripe tomatoes or tomatoes from frost-killed vines in canning because their acidity may be affected. Peppers are an excellent source of vitamin C. Capsaicin is the chemical compound found in the ribs that give peppers their “heat.” Some research studies have shown that capsaicin may reduce risk for certain types of cancer. Choose high-quality peppers that are fresh-looking, firm and thick-fleshed, and free of disease and insect damage. Peppers vary greatly in taste and degree of heat, so you can vary salsa hotness to suit your personal tastes. 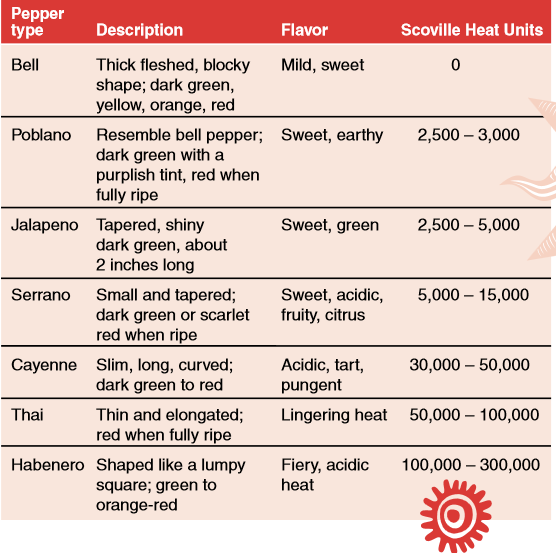 One type of pepper may be substituted for another type in salsa recipes for canning, but do not vary the total amount called for in the recipe. Hot peppers should be considered carefully by the beginner. The jalapeno is the “standard” hot pepper used in making salsa, although the heat connoisseur may choose to use chili or habanero peppers. The “fire” in these varieties is often too hot for most salsa lovers, so if you decide to grow and use them in salsa or other sauces, do so cautiously. Generally, the smaller the pepper, the hotter it tastes. Avoid direct contact with hot peppers, because the volatile oils in them can cause skin irritation or burns. Wear rubber gloves while handling them, and wash your hands thoroughly with soap and water before touching your face. Hot peppers, such as the jalapeno, do not need to be peeled but the seeds are often removed. Oven or broiler method: Place peppers in oven (400o F) or under broiler for 6 to 8 minutes until skins blister. Allow peppers to cool. Place in a pan and cover with a damp cloth to make peeling the peppers easier. After several minutes of cooling, peel each pepper. Discard seeds and chop peppers. Onions and garlic are in the Allium family. This family of vegetables contains sulfur compounds, selenium and antioxidants. These compounds are believed to stimulate the immune system, inhibit cancer growth and possibly decrease blood cholesterol. Sulfur compounds also are responsible for their characteristic flavor and smell and the tendency for onions to irritate eyes. Choose onions that are firm and free from cuts and bruises. Fresh onions usually have a thinner skin than storage onions. Store onions in a cool, dry place or refrigerate. To help avoid eye irritation, onions should be cut from the top and peeled down without trimming off the root/bottom end, since the sulfuric compounds are concentrated at the base of the onion. Others have suggested cutting onions under running water or refrigerating before cutting to decrease the tendency of onions to irritate eyes. Choose garlic heads that are firm, avoiding garlic with green growth. Store garlic in a cool, dark place. Peel and chop with a knife or use a garlic press. Select cilantro that appears fresh and green. If purchasing, look for cilantro with the roots attached. At home, place the cilantro in a sturdy container with water covering the roots; wrap the leaves loosely in a plastic bag and refrigerate. Change the water every few days and the cilantro should last about two weeks. If the cilantro has no roots, follow the same procedure, covering the stems with water. Cilantro without roots will remain fresh about one week. Acid ingredients in canned salsa help preserve it. Additional acid — bottled lemon juice, lime juice or vinegar — is needed when canning tomatoes because the natural acidity of tomatoes may be too low. Low-acid ingredients in salsa, such as peppers and onions, also affect the overall acidity level. Vinegar should be at least 5 percent acid. You can substitute lemon or lime juice in a recipe calling for vinegar, but do not substitute vinegar in a recipe calling for lemon or lime juice. Lemon or lime juice is more acidic than vinegar. Freshly squeezed lemon or lime juice may be used in fresh salsa recipes but is not recommended for use in canning recipes. NOTE: If you are using a recipe that has not been research-tested, serve it fresh, store it in the refrigerator and use it within a couple weeks, or freeze it in freezer-safe containers. Mix ingredients together and serve, altering the recipe to suit your own taste preferences. Store covered in the refrigerator. To keep calorie and fat content low, serve with baked tortilla chips. Like other foods that are preserved at home, canned salsa comes with a list of safety precautions. If you’ve created a salsa masterpiece, you’d be better off freezing it, for safety’s sake, rather than canning it. It’s especially important to follow current recommendations for food preservation, because old food preservation recipes — even Grandma’s — may not be safe based on current research. The main foodborne illness associated with foods improperly canned at home is botulism. It’s also the deadliest. Clostridium botulinum, the type of bacteria that causes botulism, thrives in an oxygen-free, or “anaerobic,” environment, such as a sealed jar or can, where it can produce a potentially fatal toxin. The hallmark symptoms are double vision and paralysis, with death being the worst-case outcome. Follow the formulation exactly and measure/weigh ingredients carefully. Use bottled lemon or lime juice or vinegar as indicated. Handle hot peppers carefully: wear plastic gloves and wash your hands before touching your face. In canning recipes calling for spices, you may safely decrease the amount of spice (cumin, oregano, pepper, etc), but do not increase the spice amounts. To alter the “heat” in salsa, you can safely substitute one type of pepper for another, but keep the total amount of pepper the same. Do not thicken salsas with cornstarch before canning. If the salsa appears thin, it can be heated and thickened with cornstarch, or some of the excess juice may be strained away, after opening the jars. Before beginning to prepare salsa for canning, fill the water bath canner about half full of clean water. For hot-packed food (like the example salsa recipes), preheat the water in the canner to about 180 F. Use a rack in the canner. Start with clean jars, and heat them in a pan of hot water. Heat lids as recommended by the manufacturer. Fill jars, leaving ½-inch headspace. After filling jars with food, remove trapped air bubbles with a nonmetallic spatula, adjusting headspace if needed. Wipe the rim of each jar carefully with a cloth or paper towel and apply the lid and screw ring. Do not over-tighten the screw ring. It should only be “finger tight” or the lids may not seal properly. Place jars in the canner using a jar lifter positioned below the screw band of the lid. Keep the jars upright at all times. Add additional boiling water, as needed, to bring the water level at least 1 inch over jar tops. Begin timing when water boils. Keep the canner covered during processing. The water should remain boiling at all times. When the processing time is complete, carefully remove the jars from the canner, using a jar lifter. Place the jars at least 1 inch apart on cooling racks or towels to cool at least 12 hours. Do not retighten screw rings. Do not expose jars to a cold surface or cold drafts, which could lead to cracking or breaking. Test seals the next day. A good seal is evidenced by a concave lid that does not move when pressed. Remove the screw rings. Label sealed jars with contents and canning date. Unsealed jars may be safely re-processed within 24 hours, or the jars of salsa may be refrigerated for fresh consumption. To reprocess, empty the salsa into a pan, heat to boiling and ladle the mixture into clean, hot jars. Use new lids and process for the full recommended time. The quality and nutrient content of twice-processed food may be lower, but the product will be safe to consume. tsp. = teaspoon 1 Tbsp. = 3 tsp. Wash hands thoroughly before handling food. Prepare peppers as described previously. Wear rubber gloves while handling chili peppers or wash hands thoroughly with soap and water before touching your face. Prepare tomatoes: Wash tomatoes. Dip in boiling water for 30 to 60 seconds or until skins split, then dip in cold water. Slip off skins and remove cores. Combine all ingredients except cumin, oregano and cilantro in a large pot and bring to a boil, stirring frequently. Reduce heat and boil 10 minutes. Add herbs and spices and simmer for another 20 minutes, stirring occasionally. Ladle hot into hot pint jars, leaving ½-inch headspace. Wipe jar rims. Cap with properly pretreated lids. Adjust lids and process in a boiling water canner for 20 minutes. Note: This recipe is best suited for paste tomatoes. Slicing tomatoes require a much longer cooking time to achieve a desirable consistency. You may decrease the amounts of spices, but increasing the amount is not advised. You may make adjustments to suit your tastes after opening the jars. Combine all ingredients in a large saucepan. Bring to a boil. Reduce heat and continue boiling for 30 minutes, stirring occasionally. Ladle hot salsa into hot pint jars, leaving ½-inch headspace. Wipe jar rims. Cap with properly pretreated lids. Adjust lids and process in a boiling water canner for 20 minutes. * Adapted from “Salsa Recipes for Canning” — Pacific Northwest Publications (PNW395) by Val Hillers and Richard Dougherty, Washington State University, 1996. Recipes also appear in “Canning Salsa Safely” — Wisconsin Safe Food Preservation Series (B3570) by Barbara H. Ingham, University of Wisconsin Cooperative Extension Service, 2000. Store canned salsa in a cool dark place and use within a year for best quality. If jars have become unsealed or there are signs of spoilage like bulging lids or bubbling or if the mixture has an odor, do not taste. Discard the jars and contents carefully — away from possible contact with humans and animals. For additional salsa/tomato canning formulations, request “Canning and Freezing Tomatoes” (FN-175) from your local office of the NDSU Extension Service.